January 6 is the traditional date for the Feast of the Epiphany, the day that the Magi came face-to-face with the Christ child. Led by the light of a star, they journeyed through the desert to meet their King. 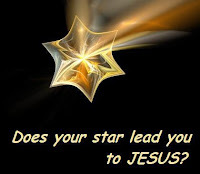 As I reflect on the journey of the three wise men, I think about the star-the light that led them to Jesus. The magi traveled at night, and their only source of light to keep them from stumbling came simply from the stars in the heavens, and one star in particular. No distractions…Just the stars and companions to lead the way. Today, we are inundated with light...so much man-made light that we often cannot see the natural lights in the heavens. Distractions abound in our daily journey to find Christ-in experiences, people, even in ourselves sometimes. Things like peer pressure, media, and personal expectations are modern-day tempters and distractions. Catchy commercials and snazzy signs draw our attention to the gods of our time such as possessions and power. They are all-too-frequent experiences that can blind us to the presence of-or even existence of-Christ. But we are also blessed to have true lights in our lives-mentors, spiritual directors, family and friends who help us see Christ and journey each day closer to Him. I am grateful for those in my life who are models of the faith, spiritual companions, and Sisters in Community. These are my "stars" who light the way, who draw my attention to finding Christ in all. Epiphanies happen every day. I am constantly being led to the Christ child, as obscure as His existence may seem sometimes. But He is there...He is HERE-in the child, in the elderly, in the poor I encounter each day, in experiences and in myself. I need only to seek, and I will find Him. I am blessed…to have encountered Him.